A few months ago, Travis CI announced early access for a Windows build environment. In the last couple weeks, I spent some time to figure out how to test Perl projects there by installing Strawberry Perl from Chocolatey. Use Windows instead of Linux to test multiple versions of Perl. This is the simplest configuration, but useful only for projects that never expect to run on a Unix-style OS. Add a Windows build stage that runs the tests against the latest version of Strawberry Perl. This pattern is ideal for projects that already test against multiple versions of Perl on Linux, and just want to make sure things work on windows. Add a build stage that tests against multiple versions of Strawberry Perl in separate jobs. 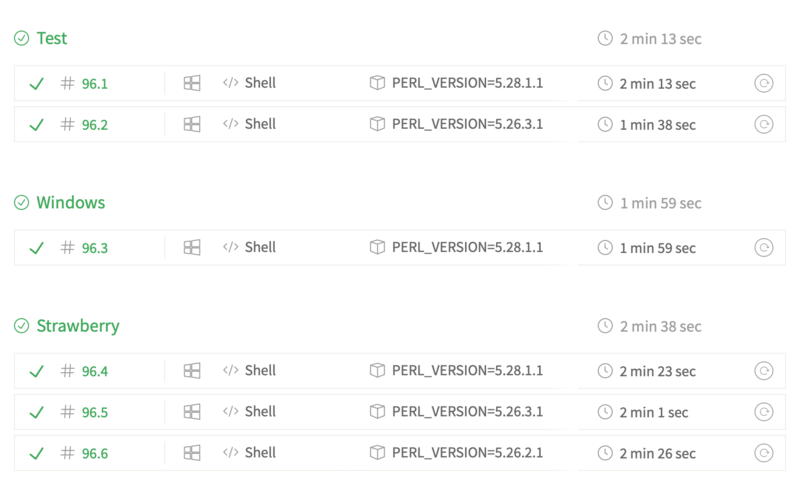 The Travis CI-default “Test” stage is the default, and runs tests on two versions of Perl on Windows. The “Windows” stage tests on a single version of Windows Perl, independent of the “Test” stage. And the “Strawberry” stage tests on multiple versions of Windows Perl independent of the “Test” stage. - cpanm --notest --installdeps . - cpanm -v --test-only . The files starts with the typical Travis Perl configuration: select the language (Perl) and the versions to test. The before_install block installs a couple of dependencies and executes the travis-perl helper for more flexible Perl testing. This pattern practically serves as boilerplate for new Perl projects. The new bit is the jobs.include section, which declares a new build stage named “Windows”. This stage runs independent of the default phase, which runs on Linux, and declares os: windows to run on Windows. The before_install step uses the pre-installed Chocolatey package manager to install the latest version of Strawberry Perl and update the $PATH environment variable to include the paths to Perl and build tools. Note that the Travis CI Window environment runs inside the Git Bash shell environment; hence the Unix-style path configuration. The install phase installs all dependencies for the project via cpanminus, then the script phase runs the tests, again using cpanminus. And with the stage set, the text-markup build has a nice new stage that ensures all tests pass on Windows. Perhaps Travis will add full Perl support and things will become even easier. In the meantime, I’m pleased that I no longer have to guess about Windows compatibility. The new Travis Windows environment enables a welcome increase in cross-platform confidence. Over the last 17 years, I’ve created, released, updated, and/or maintained a slew of Perl modules on CPAN. Recently my work has changed significantly, and I no longer have the time to properly care for them all. A few, like Pod::Simple and Plack::Middleware::MethodOverride have co-maintainers, but most don’t. They deserve more love than I can currently provide. All, therefore, are up for adoption. If you regularly use my modules, use a service that depends on them, or just like to contribute the community, consider becoming a maintainer! Have a look at the list, and if you’d like to rescue an orphan module, hit me up via Twitter or email me at david at this domain. I’ve used Subversion very occasionally since 2009, and SVN::Notify at all. Over the years, I’ve fixed minor issues with it now and then, and made the a couple of releases to address issues fixed by others. But it’s past the point where I feel qualified to maintain it. Hell, the repository for SVN::Notify has been hosted on GitHub ever since 2011. I don’t have an instance of Subversion against which to test it; nor do I have any SMTP servers to throw test messages at. In short, it’s past time I relinquished maintenance of this module to someone with a vested interest in its continued use. Is that you? Do you need to keep SVN::Notify running for your projects, and have a few TUITs to fix the occasional bug or security issue? If so, drop me a line (david @ this domain). I’d be happy to transfer the repository. I’ve just pushed Pod-Simple 3.29_v3 to CPAN. Karl Williamson did a lot of hacking on this release, finally adding support for EBCDIC. But as part of that work, and in coordination with Pod::Simple’s original author, Sean Burke, as well as pod-people, we have switched the default encoding from Latin-1 to CP-1252. On the surface, that might sound like a big change, but in truth, it’s pretty straight-forward. CP-1252 is effectively a superset of Latin-1, repurposing 30 or so unused control characters from Latin-1. Those characters are pretty common on Windows (the home of the CP family of encodings), especially in pastes from Word. It’s nice to be able to pick those up essentially for free. Still, Karl’s done more than that. He also updated the encoding detection to do a better job at detecting UTF-8. This is the real default. Pod::Simple only falls back on CP1252 if there are no obvious UTF-8 byte sequences in your Pod. 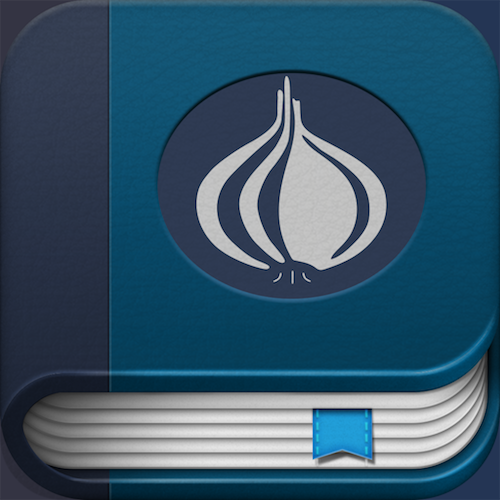 We’ve been using the CentOS Perl RPMs at iovation to run all of our Perl applications. This has been somewhat painful, because the version of Perl, 5.10.1, is quite old — it shipped in August 2009. In fact, it consists mostly of bug fixes against Perl 5.10.0, which shipped in December 2007! Many of the modules provided by CentOS core and EPEL are quite old, as well, and we had built up quite the collection of customized module RPMs managed by a massive spaghetti-coded Jenkins job. When we recently ran into a Unicode issue that would best have been addressed by running a more modern Perl — rather than a hinky workaround — I finally sat down and knocked out a way to get a solid set of Modern Perl and related CPAN RPMs. I gave it the rather boring name rpmcpan, and now you can use it, too. Turns out, DevOps doesn’t myopically insist on using core RPMs in the name of some abstract idea about stability. Rather, we just need a way to easily deploy our stuff as RPMs. If the same applies to your organization, you can get Modern Perl RPMs, too. See the README for a complete list of customization options. Or just get started with our dists.json file, which so far builds the bare minimum we need for one of our Perl apps. Add new distributions? Send a pull request! We’ll be doing so as we integrate more of our Perl apps with a Modern Perl and leave the sad RPM past behind. Nota Bene: This is a republication of a [post that originally appeared in the 2013 Perl Advent Calendar. These days, gettext is far and away the most widely-used localization (l10n) and internationalization (i18n) library for open-source software. So far, it has not been widely used in the Perl community, even though it’s the most flexible, capable, and easy-to use solution, thanks to Locale::TextDomain.1 How easy? Let’s get started! If $num_records is 1, the first phrase will be used. Otherwise the second. Congratulations! Your module is now internationalized. Wasn’t that easy? Make a habit of using these functions in all the modules in your distribution, always with the Awesome-Module domain, and you’ll be set. Locale::TextDomain is great, but it dates from a time when Perl character encoding was, shall we say, sub-optimal. It therefore took it upon itself to try to do the right thing, which is to to detect the locale from the runtime environment and automatically encode as appropriate. Which might work okay if all you ever do is print localized messages — and never anything else. You only have to do this once per domain. So even if you use Locale::TextDomain with the Awesome-Module domain in a bunch of your modules, the presence of this code in a single early-loading module ensures that strings will always be returned as Perl strings by the localization functions. So what about output? There’s one more bit of boilerplate you’ll need to throw in. Or rather, put this into the main package that uses your modules to begin with, such as the command-line script the user invokes to run an application. Locale::TextDomain will notice the locale and select the appropriate translation catalog at runtime. Now what? Well, you could do nothing. Ship your code and those internationalized phrases will be handled just like any other string in your code. Parsing the internationalized strings from your modules and creating language-specific translation catalogs, or “PO files”, for translators to edit. These catalogs should be maintained in your source code repository. Compiling the PO files into binary files, or “MO files”, and distributing them with your modules. These files should not be maintained in your source code repository. Until a year ago, there was no Perl-native way to manage these processes. Locale::TextDomain ships with a sample Makefile demonstrating the appropriate use of the GNU gettext command-line tools, but that seemed a steep price for a Perl hacker to pay. A better fit for the Perl hacker’s brain, I thought, is Dist::Zilla. So I wrote Dist::Zilla::LocaleTextDomain to encapsulate the use of the gettext utiltiies. Here’s how it works. Check out the configuration docs for details on all available attributes. Let’s give it something to do! po/fr.po: 10 translated messages, 1 fuzzy translation, 0 untranslated messages. po/ja.po: 10 translated messages, 1 fuzzy translation, 0 untranslated messages. po/en_US.po: 10 translated messages, 1 fuzzy translation, 0 untranslated messages. po/en_UK.po: 10 translated messages, 1 fuzzy translation, 0 untranslated messages. This command re-scans your Perl code and updates all of the language files. Old messages will be commented-out and new ones added. Commit the changes and give your translators a holler so they can keep the awesome going. The msg-init and msg-merge commands don’t actually scan your source code. Sort of lied about that. Sorry. What they actually do is merge a template file into the appropriate catalog files. If this template file does not already exist, a temporary one will be created and discarded when the initialization or merging is done. [LocaleTextDomain] po/fr.po: 195 translated messages. [LocaleTextDomain] po/fr.po: 148 translated messages, 36 fuzzy translations, 27 untranslated messages. Just be sure to delete the LocaleData directory when you’re done — or at least don’t commit it to the repository. Keep your translators in the loop. The Dist::Zilla::LocaleTextDomain plugin will do the rest. Update 2019-01-31: Added required malformed data configuration argument to the call to bind_textdomain_filter required by this change in Encode v2.99. With our greppy, above, we get to benefit from the parser-affecting behaviors of subroutine prototypes. My favorite tidbit about this feature? Because lexical subs are lexical, and method-dispatch is package-based, lexical subs are not subject to method lookup and dispatch! This just might alleviate the confusion of methods and subs, as chromatic complained about just yesterday. Probably doesn’t solve the problem for imported subs, though. Nevertheless, this lack of “lower than $3000” grant proposals, and the fact that lot of people have been discussing (and complaining) about this value being too low, the Grants Committee is starting a discussion on rewriting and reorganizing the way it works. Namely, in my personal blog I opened a discussion about the Grants Committee some time ago, and had plenty of feedback, that will be helpful for our internal discussion. This is great news. I would love to see more and more ambitious grant proposals, as well as awards people an subsist on. I look forward to seeing the new rules. I spent much of last week on vacation with the family so very little actual coding got done on the p5-mop, but instead I did a lot of thinking. My next major goal for the p5-mop is to port a module written in Moose, in particular, one that uses many different Moose features. The module I have chosen to port is Bread::Board and I chose it for two reasons; first, it was the first real module that I wrote using Moose and second, it makes heavy use of a lot of Moose’s features. I’m so happy to see Stevan making progress on the Perl 5 MOP again. I have been unsatisfied with Just a Theory for some time. I started that blog in 2004 more or less for fun, thinking it would be my permanent home on the internet. And it has been. But the design, while okay in 2004, is just awful by today’s standards. A redesign is something I have planned to do for quite some time. I had also been thinking about my audience. Or rather, audiences. I’ve blogged about many things, but while a few dear family members might want to read everything I ever post, most folks, I think, are interested in only a subset of topics. Readers of Just a Theory came for posts about Perl, or PostgreSQL, or culture, travel, or politics. But few came for all those topics, in my estimation. More recently, a whole bunch of top-level domains have opened up, often with the opportunity for anyone to register them. I was lucky enough to snag theory.pm and theory.pl, thinking that perhaps I would create a site just for blogging about Perl. I also nabbed theory.so, which I might dedicate to database-related blogging, and theory.me, which would be my personal blog (travel, photography, cultural essays, etc.). And then there is Octopress. A blogging engine for hackers. Perfect for me. Hard to imagine something more appropriate (unless it was written in Perl). It seemed like a good opportunity to partition my online blogging. So here we are with my first partition. theory.pm is a Perl blog. Seemed like the perfect name. I fiddled with it off and on for a few months, often following Matt Gemmell’s Advice, and I’m really happy with it. The open-source fonts Source Sans Pro and Source Code Pro, from Adobe, look great. The source code examples are beautifully marked up and displayed using the Solarized color scheme (though presentation varies in feed readers). Better still, it’s equally attractive and readable on computers, tablets and phones, thanks to the foundation laid by Aron Cedercrantz’s BlogTheme. I expect to fork this code to create a database blog soon, and then perhaps put together a personal blog. Maybe the personal blog will provide link posts for posts on the other sites, so that if anyone really wants to read everything, they can. I haven’t decided yet. In the meantime, now that I have a dedicated Perl blog, I guess I’ll have to start writing more Perl-related stuff. I’m starting with some posts about the state of exception handling in Perl 5, the first of which is already up. Stay tuned for more. Update: 2018-05-23: I decided that a separate Perl blog wasn’t a great idea after all, and relaunched Just a Theory. I can’t tell you how often this quirk burns me. Not every exception handler requires so many conditions, but I have certainly exercised all these approaches. Usually my exception handlers accrete condition as users report new, unexpected errors. When JSON throws an exception on invalid JSON, the code must catch that exception to show the user. The user cares not at all what file threw the exception, nor the line number. The code must strip that stuff out before passing the original message off to a localizing error method. It’s time to end this. A forthcoming post will propose a plan for adding proper exception handling to the core Perl language, including exception objects and an official try/catch syntax. As of this writing, only PostgreSQL is supported, so you will need to install PostgreSQL. This makes it easy to get started with Sqitch on any of those platforms without having to become a Perl expert. So go for it, and then get started with the tutorial! Here’s a followup on my post about localizing Perl modules with Locale::TextDomain. Dist::Zilla::LocaleTextDomain was great for developers, less so for translators. A Sqitch translator asked how to test the translation file he was working on. My only reply was to compile the whole module, then install it and test it. Ugh. [LocaleTextDomain] po/fr.po: 155 translated messages, 24 fuzzy translations, 16 untranslated messages. I hope this simplifies things for translators. See the notes for translators for a few more words on the subject. I’ve just released Dist::Zilla::LocaleTextDomain v0.80 to the CPAN. This module adds support for managing Locale::TextDomain-based localization and internationalization in your CPAN libraries. I wanted to make it as simple as possible for CPAN developers to do localization and to support translators in their projects, and Dist::Zilla seemed like the perfect place to do it, since it has hooks to generate the necessary binary files for distribution. Starting out with Locale::TextDomain was decidedly non-intuitive for me, as a Perl hacker, likely because of its gettext underpinnings. Now that I’ve got a grip on it and created the Dist::Zilla support, I think it’s pretty straight-forward. To demonstrate, I wrote the following brief tutorial, which constitutes the main documentation for the Dist::Zilla::LocaleTextDomain distribution. I hope it makes it easier for you to get started localizing your Perl libraries. Locale::TextDomain provides a nice interface for localizing your Perl applications. The tools for managing translations, however, is a bit arcane. Fortunately, you can just use this plugin and get all the tools you need to scan your Perl libraries for localizable strings, create a language template, and initialize translation files and keep them up-to-date. All this is assuming that your system has the gettext utilities installed. I put off learning how to use Locale::TextDomain for quite a while because, while the gettext tools are great for translators, the tools for the developer were a little more opaque, especially for Perlers used to Locale::Maketext. But I put in the effort while hacking Sqitch. As I had hoped, using it in my code was easy. Using it for my distribution was harder, so I decided to write Dist::Zilla::LocaleTextDomain to make life simpler for developers who manage their distributions with Dist::Zilla. What follows is a quick tutorial on using Locale::TextDomain in your code and managing it with Dist::Zilla::LocaleTextDomain. Locale::TextDomain uses this value to find localization catalogs, so naturally Dist::Zilla::LocaleTextDomain will use it to put those catalogs in the right place. Pretty simple, right? Get to know these functions, and just make it a habit to use them in user-visible messages in your code. Even if you never expect to translate those messages, just by doing this you make it easier for someone else to come along and start translating for you. Now you’re localizing your code. Great! What’s next? Officially, nothing. If you never do anything else, your code will always emit the messages as written. You can ship it and things will work just as if you had never done any localization. Consult the LocaleTextDomain configuration docs for details on all available attributes. Now at least you know it was looking for something to compile for distribution. Let’s give it something to find. At this point, the gettext utilities will need to be installed and visible in your path, or else you’ll get errors. As you can see, each language results in the generation of the appropriate file in the po directory, sans encoding (i.e., no .UTF-8 in the en_US file name). These binary catalogs will be installed as part of the distribution just where Locale::TextDomain can find them. This prevents the po directory and its contents from being included in the distribution. Sure, you can include them if you like, but they’re not required for the running of your app; the generated binary catalog files are all you need. Might as well leave out the translation files. This will scan your module files again and update all of the translation files with any changes. Old messages will be commented-out and new ones added. Just commit the changes to your repository and notify the translation army that they’ve got more work to do. Both the msg-init and msg-merge commands depend on a translation template file to create and merge language files. Thus far, this has been invisible: they will create a temporary template file to do their work, and then delete it when they’re done. And that’s all there is to it. Go forth and localize and internationalize your Perl apps! My thanks to Ricardo Signes for invaluable help plugging in to Dist::Zilla, to Guido Flohr for providing feedback on this tutorial and being open to my pull requests, to David Golden for I/O capturing help, and to Jérôme Quelin for his patience as I wrote code to do the same thing as Dist::Zilla::Plugin::LocaleMsgfmt without ever noticing that it already existed. Sqitch uses the native database client applications (psql, sqlite3, mysql, etc.). So for tracking metadata about the state of deployments, I have been trying to stick to using them. I’m first targeting PostgreSQL, and as a result need to open a connection to psql, start a transaction, and be able to read and write stuff to it as migrations go along. The IPC is a huge PITA. Furthermore, getting things properly quoted is also pretty annoying — and it will be worse for SQLite and MySQL, I expect (psql’s --set support is pretty slick). If, on the other hand, I used the DBI, on the other hand, all this would be very easy. There is no IPC, just a direct connection to the database. It would save me a ton of time doing development, and be robust and safer to use (e.g., exception handling rather than platform-dependent signal handling (or not, in the case of Windows)). I am quite tempted to just so that. However, I have been trying to be sensitive to dependencies. I had planned to make Sqitch simple to install on any system, and if you had the command-line client for your preferred database, it would just work. If I used the DBI instead, then Sqitch would not work at all unless you installed the appropriate DBI driver for your database of choice. This is no big deal for Perl people, of course, but I don’t want this to be a Perl people tool. I want it to be dead simple for anyone to use for any database. Ideally, there will be RPMs and Ubuntu packages, so one can just install it and go, and not have to worry about figuring out what additional Perl DBD to install for your database of choice. It should be transparent. That is still my goal, but at this point the IPC requirements for controlling the clients is driving me a little crazy. Should I just give up and use the DBI (at least for now)? Or persevere with the IPC stuff and get it to work? Opinions wanted!